My husband used to get these red skin potatoes from their office cafeteria. He once packed it for us to try it and we were convinced for what he was bragging about. Since then I make these red skin potatoes and my kids love them. They cannot get enough of these potatoes. I usually make them as a side when I bake chicken. 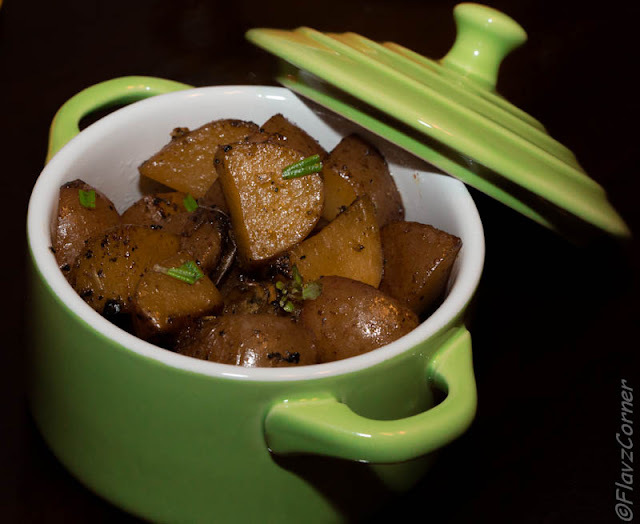 You can use these potatoes as a side dish for your thanksgiving dinner. Without much ado here is the recipe for 'Red Skin Potatoes'. Take a non stick pan and heat 1 tbsp of olive oil. Add the Montreal chicken seasoning and lemon pepper to it and roast on slow heat till a nice aroma comes. Add the halved potatoes and stir with the cooked seasoning. Adjust the salt. Cover and cook on low to medium heat for 6 - 8 minutes or till the potatoes are well done and still retains its shape and color. Add the fresh herbs and turn off the flame. Serve as a side with Thanksgiving Chicken or turkey. 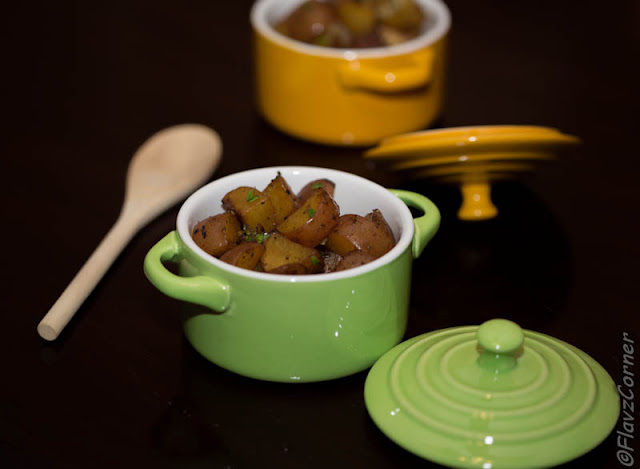 I use baby red skin potatoes for this recipe. 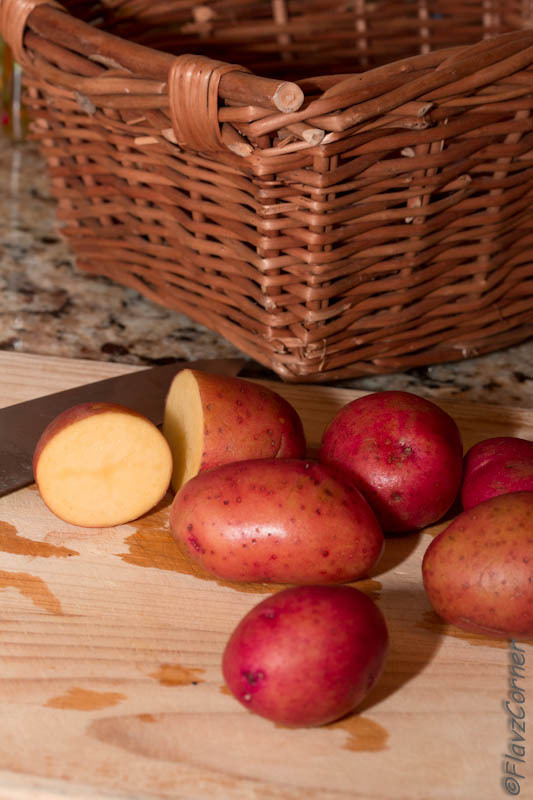 If you are using big red skin potatoes make sure that they are cut into bite size peices so that they can be cooked easily without losing the color of the skin. I love potatoes in any form..havent seen red skinned ones here..wonder if they taste diff?? Thanks Nisha for the info on the rice!! 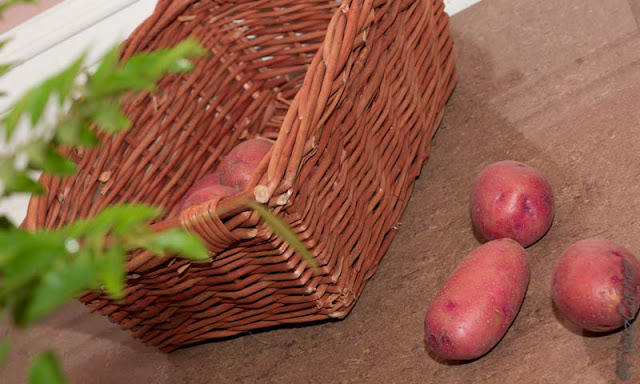 I love potatoes and these red skin potatoes look really good Shibi. I also make them very often and all of us love it. Thanks Shema!!! I was not really happy with the outcome this time, I overcooked a bit, so it didn't retain the color that much even though it tasted good. Potatoes with skin are the best! And I love rosemary addition-) Delicious!